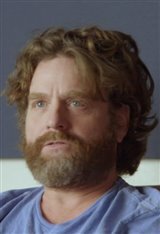 Zach Galifianakis moved to New York City after failing his last college course by one point at North Carolina State University. He got his start performing his brand of humor in the back of a hamburger joint in Times Square, graduating to stand-up in clubs and coffee houses in the city. While working as a busboy, he got his first acting job with a recurring role from 1996 to 1997 on the NBC sitcom Boston Common. Among his film credits are the comedy What Happens in Vegas (2008) starring Cameron Diaz and Ashton Kutcher, Sean Penn's critically acclaimed Into the Wild (2007) and a starring role in the hugely successful comedy The Hangover (2009). He appeared as a similar character in Due Date (2010), where he played opposite Robert Downey Jr., before reprising his Hangover role in a 2011 sequel, and again in the third installment of the films in 2013. He also starred opposite Will Ferrell in Jay Roach's The Campaign (2012), a comedy about an ordinary man who runs for office. His television work includes series regular roles on Tru Calling and the HBO comedy Bored to Death and appearances on such shows as Reno 911! and The Sarah Silverman Program. He also hosted his own critically acclaimed VH-1 talk show Late World with Zach and wrote for/starred in Comedy Central's Dog Bites Man. In 2008, he was the writer and co-creator of the Comedy Central pilot Speed Freaks. He was then seen in The Hangover (2009), The Hangover Part II (2011) and The Hangover Part III (2013). Next he starred in the dramedy Are You Here (2013) and the Oscar-winner for Best Picture, Birdman or (The Unexpected Virtue of Ignorance) (2014). Other credits include the action comedy Keeping Up with the Joneses (2016), the animated action-adventure flick The LEGO Batman Movie (2017), which also features the voices of Will Arnett, Jenny Slate and Ralph Fiennes, and the period drama Tulip Fever (2017) with Alicia Vikander, Cara Delevingne and Dane DeHaan. He also played Happy Medium in the film adaptation of Madeleine L'Engle's classic novel A Wrinkle in Time , opposite Oprah Winfrey. Most recently, he lent his voice as Mr. Link in the animated film, Missing Link (2019). When not filming, Zach continues to tour the country performing stand-up comedy in rock clubs, coffee houses and universities. On August 11, 2012, he married Quinn Lundberg. They have a son, born on September 7, 2013.